Here is a typical example of why Markets are Efficient. Infosys, the famous IT company of India, has declared a good dividend – Rs. 7.5 as a final dividend and Rs. 20 as a special dividend – totaling it to a dividend of Rs. 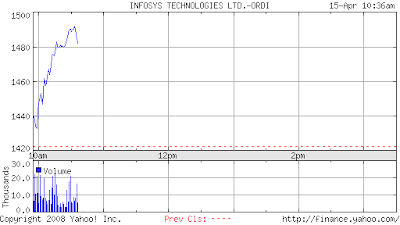 27.5 per share of Infosys. So how long does it take for the price of infosys to reflect that? The dividend amount is only Rs. 27.5, while the stock price immediately shot up by almost 60 Rs. Anyone trying to capitalize upon this opportunity will have to do it in a spilt second or within a matter of few minutes. Anyways, I’m happy to see that Infosys which has been seeing stock prices going down from the highs of 2500 to the lows of 1300, is now coming out with dividend. I am regular reader of your blog. You have posted very good articles in the starting. But since last three months you are just posting daily news and analysis. You can have several other topics covered like options, futures, derivative. As you are very good at putting complex financial instruments in relatively simple manner, You can write more about other parts of financial world. I feel exactly like Chaitanya. I didn,t mention it earlier because if I said anything like this , one of your fans by name Vishal and few others like him would have been offended and would have started to curse.